The MiG-35 multirole jetfighter fully meets the demands of modern-day aerial combat and will be a welcome addition to Russia’s fleet of light frontline fighters, the Russian Airspace Forces’ former deputy commander, Col. Gen. Nikolai Antoshkin told RIA. The Kremlin press service earlier said that President Vladimir Putin would attend a demonstration flight of the top-of-the-line fighter during a meeting with members of the Military-Industrial Commission on Thursday. “The MiG-35 is a multirole fighter for our frontline aviation. It is a real game-changer in modern aerial combat. I am sure that the Commander-in-Chief fully realizes its potential,” Antoshkin said. He added that the MiG-35 would be in high demands due to its unique tactical and technical characterizes that make it standout from its existing counterparts. “This plane is much needed because it is more lightweight compared to the Su-27, Su-30, Su-34 and Su-35 fighters and it will be a good addition to our fleet of frontline fighters I wish I could fly this amazing plane myself,” Nikolai Antoshkin said. The MiG-35 is a multipurpose generation 4++ fighter and an advanced derivative of the original MiG-29 fighter.It is armed with a 30-mm cannon and carries 1,500 rounds of ammunition. It can carry up to 7,000 kg of payload on ten external pylons. It can also use various air-to-air and air-to-surface missiles, guided and unguided rockets and bombs. The MiG-35 has a maximum speed of 2,700 kilometers an hour, an effective range of 1,000 kilometers and a service ceiling of 17,5000 meters. Serial purchases of the MiG-35 multirole fighter under the state arms procurement program will begin in 2019, President of the United Aircraft Corporation (UAC) Yury Slyusar said Thursday. He added that a presentation of the MiG-35 for potential foreign buyers will be held on January 27. Ukraine has announced an end to its missile drills near Crimea. KIEV (Sputnik) — The Ukrainian Armed Forces have wrapped up surface-to-air missile tests in southern Ukraine, Chief of General Staff Gen. Viktor Muzhenko said Friday. “Flight and control tests of anti-aircraft guided missiles are successfully completed. The armed forces have taken an important step in increasing their combat capability and gaining opportunities to protect their state,” Muzhenko wrote on his Facebook page. Russia’s air transport agency Rosaviatsia said last week that Ukraine unilaterally decided to hold missile firing exercises near Crimea’s Simferopol on December 1-2 in violation of international agreements. 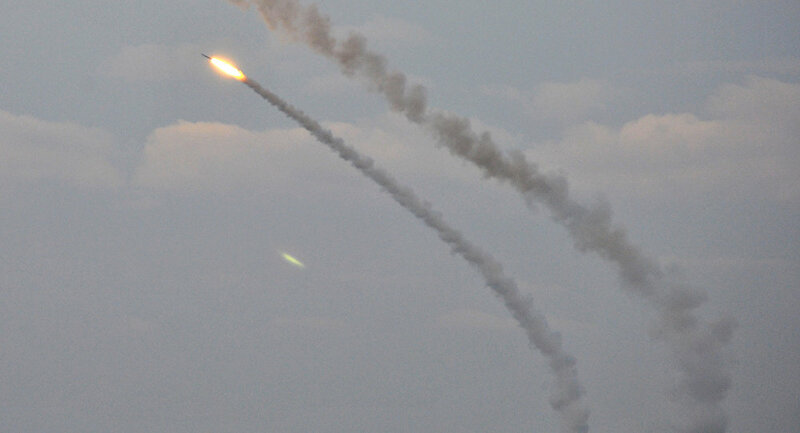 Moscow repeatedly called Kiev’s missile launches in the Black Sea a threat to the safety of Russian civilian flights to Crimea and a provocation. Russian aviation authorities also informed the International Civil Aviation Organization (ICAO) about the tests, so far without a response. The Russian Defense Ministry summoned Ukraine’s defense attache last week to serve a note protesting Kiev illegally restricting the use of airspace over the Black Sea during the missile firing drills near Crimea. (FNA)- Tens of ISIL oil tankers were destroyed in the Syrian airstrikes in Deir Ezzur province. The Syrian intelligence forces monitored the terrorists’ moves in the Eastern parts of Deir Ezzur and the oil-rich region of al-Abed and provided the Air Force with intelligence on the whereabouts of tens of ISIL oil tanker trucks. The Syrian fighter jets then targeted the ISIL oil tanker trucks by pounding them several times and destroyed tens of them. Also, dozens of other oil trucks were filling their tanks when they were targeted by the Syrian warplanes. At least 40 ISIL terrorists were killed and tens of others were wounded during the operations. In recent months, the Syrian and Russian air campaign have destroyed a large number of oil extraction, refining and pumping facilities in the territories controlled by terrorists in Syria, as well as thousands of tanker trucks used to deliver the oil products. The terrorists have lost their main source of revenues from the illegal sale of oil, which, in turn, has limited their possibilities for the purchase of armaments, ammunition and the provision of money allowance to Takfiri militants. A French fact-finding committee said on July in a report that the ISIL terrorist group has been facing very bad financial situation in 2016, while the number of its forces has been continuously decreasing in the recent months too. “In 2015, the ISIL terrorist group earned over $3bln in Iraq and Syria, including $600mln from exports of crude oil and $300mln from gas, but after the ISIL-held regions, specially energy-rich regions, shrank the group faced sharp decline in its revenues,” the report, carried out by 60 journalists and activists, said. “The ISIL had to find new sources of income. Trafficking of drugs, smuggling of historical monuments, looting museums, imposing high taxes on consumption of water and electricity stood atop the ISIL’s new resources of revenues,” the report added. A captured militant from ISIL terrorist group who spoke to Sputnik news agency on January has bolstered claims that Turkey is involved in illegal oil deals with the Takfiri group up to the hilt. 24-year-old Mahmud Ghazi Tatar had revealed details about Turkey’s alleged oil links to the terrorist group. “At the training camp in May 2015, our commander told us that the group sells fuel to Turkey. That income covers ISIL’s costs. The oil trucks crossing into Turkey every day carry crude oil, as well as petrol,” he said, adding that the ISIL group has enough oil to last them a long time. “ISIL also receives lots of supplies from Turkey and Arab countries,” the captured militant confirmed. The Russian defense ministry had also announced that Turkish President Recep Tayyip Erdogan and his family members are directly involved in illegal oil deliveries from ISIL oil fields in Syria. Turkey’s leadership, including President Erdogan and his family, is involved in illegal oil trade with ISIL militants, the Russian Defense Ministry had said, stressing that Turkey is the final destination for oil smuggled from Syria and Iraq. Satellite and drone images showed hundreds and hundreds of oil trucks moving from ISIL-held territory to Turkey to reach their destination at Turkish refineries and ports controlled by Turkish president’s family. 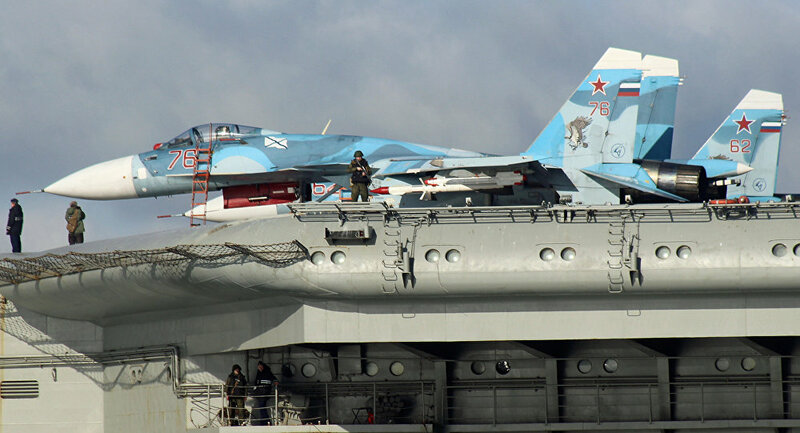 Sea-based jets of the aircraft-carrying cruiser Admiral Kuznetsov which arrived in the Syrian coast heading a group of the Russian Northern Fleet’s squadron started flights, Commander of the ship Sergei Artamonov said. They jets are practicing interaction with one of the coastal airfields, he added. “The flights are conducted from the deck of the aircraft-carrying heavy cruiser, interaction with a coastal airfield is being worked out. The flights have been carried out almost on a daily basis for four days,” Captain 1st Rank Artamonov told Vesti v Subbotu news program on Rossiya-1 TV channel. October 15, Russia’s Northern Fleet’s press service said that a group of warships headed by the aircraft-carrying cruiser Admiral Kuznetsov accompanied by the Pyotr Veliky battle cruiser, the Severomorsk and Vice-Admiral Kulakov anti-submarine destroyer, and support vessels was sent to the Mediterranean to hold drills and strengthen capabilities. Meanwhile, the commander of the Pyotr Veliky guided missile cruiser Vladislav Malakhovsky said that no foreign ships have approached the Russian squadron. “No one is flying over us. Everybody avoids approaching closer than 50 kilometers, knowing well about the power and impact force of the two cruisers,” he said speaking about Admiral Kuznetsov and Pyotr Veliky cruisers. LE BOURGET (France), October 19. /TASS/. Russia’s anti-terror operation in Syria has increased the interest of foreign customers in Russian weapons, Deputy Director of the Federal Service for Military and Technical Cooperation Anatoly Punchuk told TASS on Wednesday. “No doubt, during the ongoing Syria operation, the Russian combat hardware has demonstrated its high tactical and technical characteristics in combat conditions. The successes of our anti-terror contingent have increased the interest of foreign customers in the entire range of Russian-made military products, including naval hardware,” he said at the 25th Euronaval-2016 international naval show. Russia launched its anti-terror operation in Syria on September 30, 2015 at the request of Syrian President Bashar Assad. The anti-terror operation involves Russian combat aircraft, including strategic bombers. The operation’s active phase lasted until March 15, after which Russia withdrew its basic contingent from Syria. This week Russian President Putin ratified an agreement with the Syrian government that allows Russia to use the Hmeymim air base in Syria indefinitely. Sputnik delves into the details of the Russian facility in Syria’s Latakia province. The agreement, which was signed between Moscow and Damascus on August 26, 2015, had been previously approved by both chambers of Russia’s parliament. Among other points, it notes that the Russian air group is stationed at the Hmeymim airfield in the Latakia province free of charge at the request of Syria. Under the agreement, Russian military personnel and their family members are granted immunity identical to that provided by the Vienna Convention on Diplomatic Relations. The structure of the air group is defined by Russia upon agreement with Syria. The group acts in accordance with the plans put forward and agreed upon by both sides. Russia has the right to bring onto Syrian territory armament, ammunition, equipment and materials necessary for completion of the tasks of the air group and for provision of security and life-sustaining activities of the military personnel. They are not subjected to any duties, fees or levies. The military personnel of Russia’s air group has the right to cross the Syrian border without encumbrance with the documents valid for travel outside Russia and is not subjected to security checks by Syrian border guards or customs officers. The air group officers are relieved of any direct or indirect taxes. September 30, 2016 marked one year since Russia launched its aerial campaign in Syria under the official request of the Syrian government. According to Viktor Murakhovsky, editor-in-chief of Arsenal of the Motherland journal, since then the Russian air group has conducted about 16,000 sorties and over 54,000 air strikes on the positions of the rebel groups operating on the Syrian territory: their command centers, workshops which manufactured self-made explosives and ammunition, military hardware. Russian Aerospace Forces have eliminated about 5,000 terrorists, 2,700 of whom were either of Russian or CIS origin, the expert told RT news channel. The Russian air group has destroyed 125 tanks and several thousand trucks mounted with weapons, 200 objects of illegal oil infrastructure and has delivered over 1.5 tonnes of humanitarian aid. “The presence of the Russian air group on the territory of the Syrian Arab Republic answers in full the purposes of maintaining peace in the region,” member of Russia’s Federation Council’s (upper chamber of the Russian parliament) Committee on Defense and Security Olga Kovitidi told RT. “The ratification of the agreement on the indefinite presence of the Russian air group at the Hmeymim base will become a basis for its systematic and planned operations within the military campaign for the benefit of friendly Syria,” she said. Kovitidi also noted that the signed agreement establishes international legal norms which regulate the number of personnel and the terms of deployment and operation of the Russian air group. Such agreements are the only legal instrument in the international practice for the use of foreign military bases. The implementation of this agreement will be Russia’s practical contribution into the efforts of the international community to stabilize the situation in Syria and to fight against international terrorism, she stated. 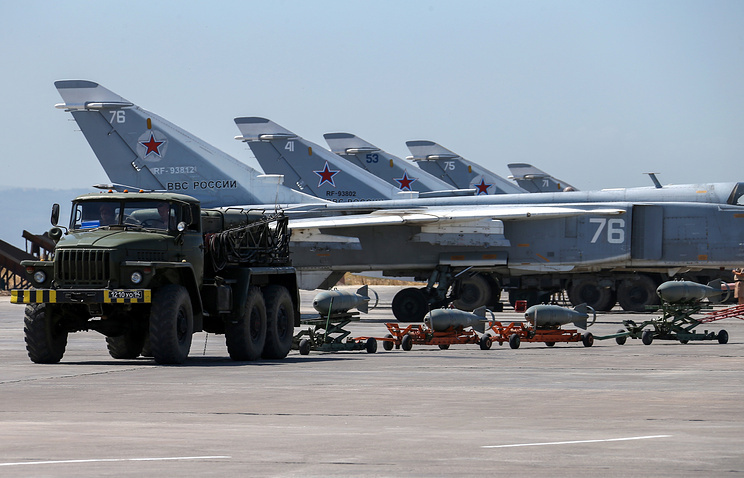 Meanwhile Viktor Murakhovsky revealed that at the moment there are 16 Russian combat aircraft deployed at the Hmeymim air base: 12 Su-24M supersonic, all-weather attack aircraft and 4 Su-34 advanced fighter-bombers. “On average, they perform 40-50 sorties per day, which is relatively inexpensive for the Russian budget,” he told RT. “In comparison, Russia’s Airspace Forces have over 1,500 combat aircraft which spend about 2 million tonnes of fuel per year, not including the operation in Syrian. Thus the daily operations of 15-20 aircraft in Syria are insignificant,” the expert said. He also noted that President Putin has made it clear that there were no additional means allocated from the country’s budget for this aerial campaign and that it keeps within the expenditures allocated by Russia’s Defense Ministry to the operative and combat training. The expert also noted that there are over 4,000 Russian servicemen currently on station at the Hmeymim base. In addition to the aircraft already mentioned, there are also Tu-22, Tu-95 and Tu-160 strategic strike bombers operating in Syria.